If you are in Uganda, you are still enjoying your three day weekend and because this Monday is a public holiday, you probably have no Monday blues today. But you will need these tomorrow when your Tuesday looks worse than your usual Mondays because of all that you put off last week as you happily imagined that the holiday would never end. 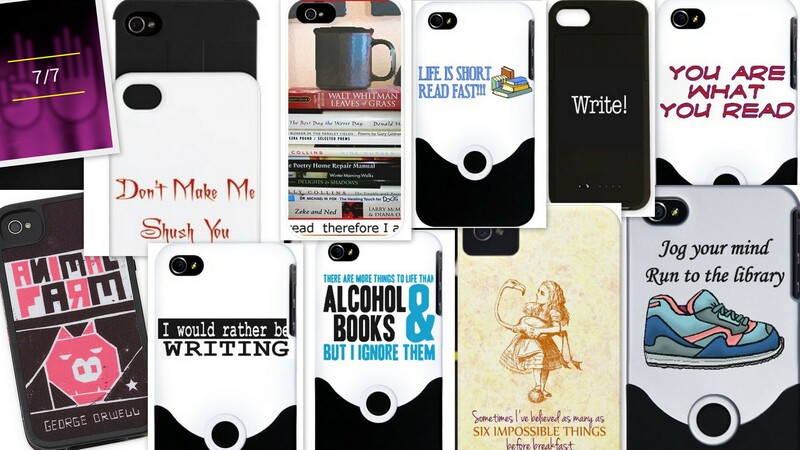 smart phone cases, skins and covers for book lovers. I want! 1. The pdfs of the five shortlisted Caine Prize stories have been on the Caine Prize website since the announcement in April. Reviews of the stories by different bloggers have been up over at Brittle Paper (save for Chela’s Chicken which should be up soon), and now, the Caine Prize has introduced podcasts of the stories (three of them read by the authors). Listen to them here. 2. African Literature blogger, James Murua is making your favourite writer more accessible to you for a chat. Last week, he introduced the African Author Google Hangout where we, fans of African literature, will be able to interact with our favourite authors from all over the continent. The hangout will happen every two weeks, each time with a different discussion and authors. More details here. 3. If you have read Mehul Gohil’s work, you have definitely noticed that he knows his Nairobi really well. He will take you on a tour so good that the next time you are in Nairobi you will be excited to recognise some of the landmarks from his stories. Here he tells us where (and at what time) you can go book-hunting in Nairobi. 4. Can it ever be right to use true crime and real suffering as the basis for entertainment? Do you ever think of the victim’s families while you write crime fiction? What are the chances that they will read your work? What are the chances that they won’t? How far should you, a writer, intrude on actual events? Here is the discussion on the duty to treat somebody else’s tragedy with respect. 5. Nigerian writer and author, Elnathan John on How to deal with an insurgency: A Handbook of the Nigerian Government. 6. Doreen Baingana. Goretti Kyomuhendo. Helon Habila. Mukoma wa Ngugi. Aminatta Forna. Monica Arac de Nyeko. Nii Aye Parkes. Arundhati Roy. All writers whose literary agent is David Godwin of David Godwin and Associates. David Godwin will be in Kampala and will be hosted at Femrite’s Author (Guest) of the Month on Monday 16th June. Here is our chance to find out what agents look for in a book. You may need these? 7. Dear Kampala importers of smart phone covers, skins and cases, can you get some cool covers for us book lovers? If you can get me the “Don’t make me shush you” one, I will be grateful.